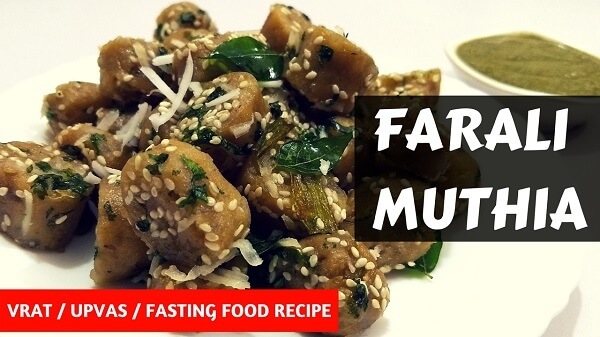 Today I am sharing a recipe of Farali Muthia (without Dudhi/Bottle gourd), you can eat during fasting days like Navratri & Shravan. Made from Rajgira & Sabudana and tempering with Sesame seeds enhances the aroma and taste of the Farali Muthia. 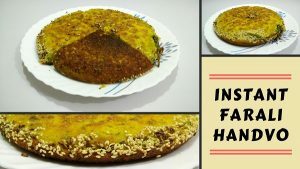 If you are getting bored with old fasting food recipes, do try this during your fasting days. Soak Sabudana in clean water for 3 – 4 hours. Grind roasted Peanuts in a mixer and make a fine powder. Take a large bowl, add soaked Sabudana, Rajgira flour, Potato and Peanut powder. Also, add Chilli & Ginger Paste, Soda and Salt. Mix well all the ingredients to prepare the dough for Farali Muthia. Grease the plate with oil and boil water in steamer / Idli cooker. Apply some oil in your palm as well as on the flat surface. Take a small portion of the dough and roll into a cylindrical shape on the flat surface. Place it on greased plate and steam for 10 – 12 minutes in a steam cooker. Remove from the steamer and let it cool down. After cooling, slice each roll into small size Muthias. Add Curry Leaves and Green Chillies, sauté for about 3 seconds. Add Sesame Seeds and Muthia, saute for about a minute. Sauté for 2 – 5 minutes if you like to make it more crispy. Add fresh coriander and grated coconut, mix well and switch off the gas. Serve hot Farali Muthia with Tea or Farali Chutney.